My home has been officially Spring-ified! green instead of white, but this is New York after all. Everything I used here was stuff I already had on hand. I LOVE that blue chest Gina!! Isn't great to be able to see the grass again!! Love it Gina! We have had very little snow here this year.... But I am so ready for the "brown" landscape to turn green. I don't post much in Jan - March but am finishing up my spring mantel as well... Stay tuned ! Love the little bit of checkered ribbon on the candle too. Little details like add a special touch. Spring is on it's way, and before you know it, all that snow will melt away. 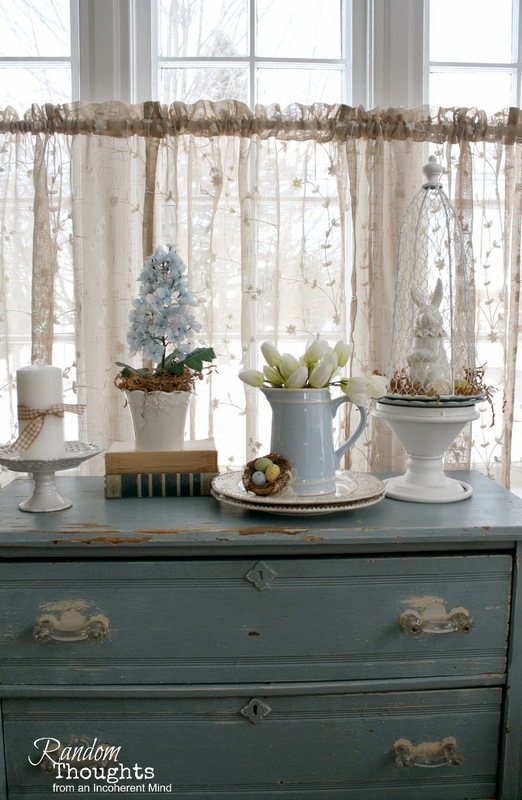 Love the blue dresser and all the soft colors you put with it, so pretty!! The white stuff is starting to melt, seeing some green along the road side, long way to go!!! So pretty, Gina! Our snow has left but as you say, there may be some in the forecast for us on Friday! Yikes! Today it is lovely, near 60. Our grass is still quite brown and very very soggy. HI Gina! Oh, this is a gorgeous vignette! I love it and the light coming through your window is pretty even if the snow is outside. We still have snow and I'm beginning to get tired of it. 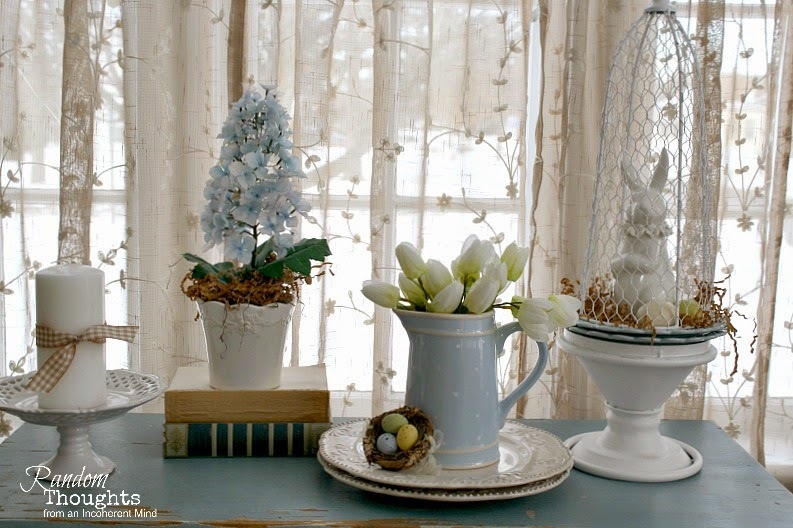 I love your pretty, spring-y vignette, Gina. Did you paint the blue chest? I love when things are found just around the house to pull the look together. I hope your snow leaves soon! Hi Gina - you have me thinking of springtime! After today my green shamrock things get put away and the big Easter/Spring box comes out! Nothing new, just lots of great favorites. Why did I think you lived in Ohio? Weird. My old brain doesn't work sometimes. Well no WONDER we haven't gotten together yet, haha. Happy St. Patrick's Day to one of my favorite Italians, next to St. Pat himself, who was Italian, and my hubs. Hugs. Gina, I love that dresser and the dotty pitcher! You really have had quite the year. And then there's us. . .no snow to speak of. We are probably going to be in trouble come July. Happy Spring! Blue and white is my favorite, and always will be! Your dresser is a beauty as well. The whole vignette says spring is on the way!! Beautiful dresser, Gina, and I want that blue and white polka dot pitcher!!! As, always, you have an amazing talent for arranging different objects to achieve fabulous vignettes - love! 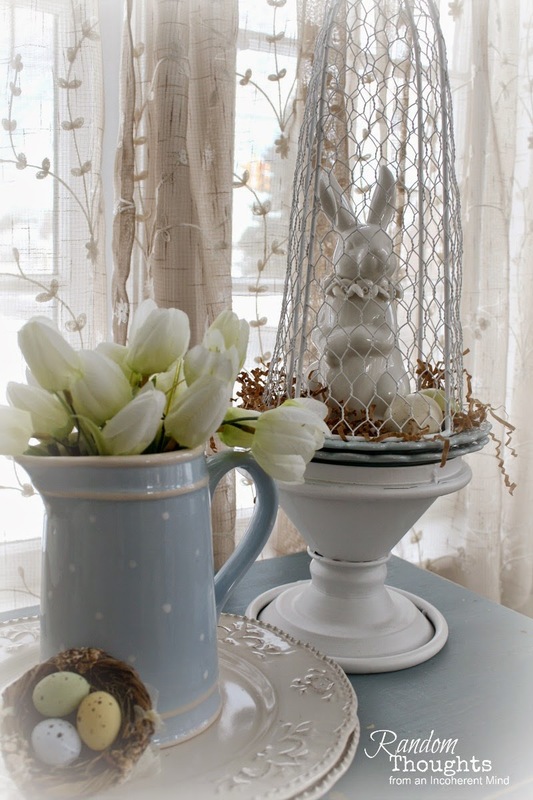 The subtle hue of the blue pitcher filled with white tulips is exquisite!!! Love your darling blue chest..and the sheers behind it...everything looks so pretty. Now I thought springified was a real word.. just like summerfied and fallified... I'm sick of winterfied. Beautiful vignette Gina. I love your curtains too. Everything so pretty!